The trail starts out going north around the mountain then heads uphill and gives you some good inclines with switch backs. Total incline is approximately 650'. 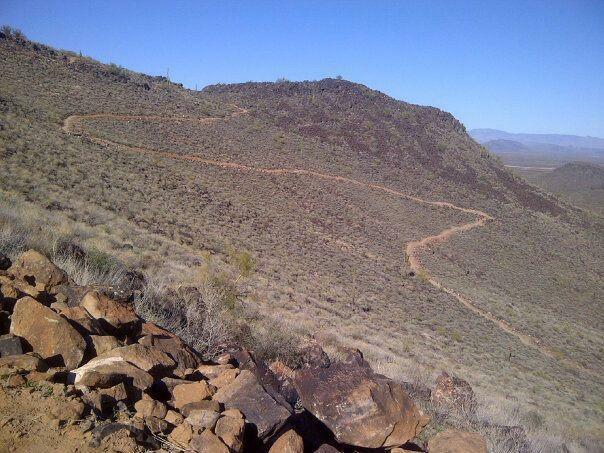 The trail is rocky and has several different loops that you can take. It has some fun downhills as you back to the trailhead. It is a great after work trail. Some fun riding in less than an hour if you don't have lots of time. Review: This trail is fun yet challenging. If you start on the east side of the mountain you gradually incline until you wrap half way around then a short stretch of down hill. There are two uphill trails that branch off the east entrance. One intermediate short climb and the other more advanced steep climb. Review: Fun short trail that you can get done in an hour. Starting from east side parking lot you hit open gradual climb gravel, great warm up for mile or so. Then you get to actual riding. Easy/moderate riding for another mile then half way around mountain you come across park w/ restrooms if u need to stop. Second half gets fun, climbing works you out, steep steady climb with some loose rocks complimented by fun mini switch backs, a few more climbs then decents then you're back at you veh. All single track and some hikers so beware. Review: Fun trail, this trail has a little bit of everything. Some areas with little elevation change, some challenging climbs/downhill sections, and some rolling hills. Fun ride. Also, I recently learned of a better way to get here: Take Happy Valley to 51st ave go north on 51st, turn right at the 4 way intersection (I think this is Deem Hills Parkway or something like that.). Continue until you find a right turn that goes through some gates and to deem hills park. Map is posted at the southeast corner of the parking lot and the main trail entrance is along the sidewalk east of the soccer fields, just north of the parking. Much more parking here than the other trailhead, and easier (for me anyway) to get to. Review: This is a really fun trail and not very rocky at all, compared to most other trails in the area. The climbing is excellent, challenging without being so steep and/or rocky that you have to stop and push. With the side trails and small loops, it's not hard to get 10-15 miles in with 1500-2000 feet of climbing. Not a fast trail due to alot of turns and hills, but it's a good time. Deem Hill MTB Trail 4.14 out of 5 based on 7 ratings. 7 user reviews.